Small differences in beak size can have large energetic consequences when environmental conditions are hot and dry. Most songbirds breed only during a short window of time annually in the spring and summer, when they must find a mate, reproduce, and raise their young. Performing these activities efficiently and effectively requires a lot of energy, which is a physiological challenge – especially in the hot and dry conditions that often accompany summer months in certain geographic regions and habitats. Active breeding birds in these conditions must regulate their temperature and maintain water balance internally while singing, nest-building, foraging, defending territories, and feeding young, among the other metabolically demanding tasks necessary for reproductive success. When overheated, birds must balance a tradeoff between performing temperature regulation behaviors and performing reproductive behaviors. Because siring healthy bird babies is so energetically challenging yet so functionally important, traits and behaviors that can help birds be energy efficient during the breeding season are likely favored within these populations. One such trait – the size of a bird’s beak - just might play a role in helping birds deal with this environmental strain. How does that work? Well, biologists David Luther and Ray Danner of George Mason University had the idea – perhaps bird beaks are adaptive not just for plucking worms from the soil, but also for helping with internal temperature regulation during the breeding season. Bird beaks are known to dissipate excess heat without water loss, unlike respiration (breathing) in which heat and water are lost together. Therefore, Luther and Danner thought that beak size might really matter for songbirds breeding in hot, dry environments. They hypothesized that larger-beaked males would have an advantage over smaller-beaked males in such environments – that they’d be better able to regulate their temperature and water balance, and thus would be able to remain more active during the breeding season. This could confer the larger-beaked birds greater reproductive benefits, or fitness, over their smaller-beaked counterparts. If true, selection could be pushing increased beak sizes as the climate warms. Eager to test their idea, the biologists ventured into the field – the sand dunes of Delaware Seashore State Park (Fig. 1. 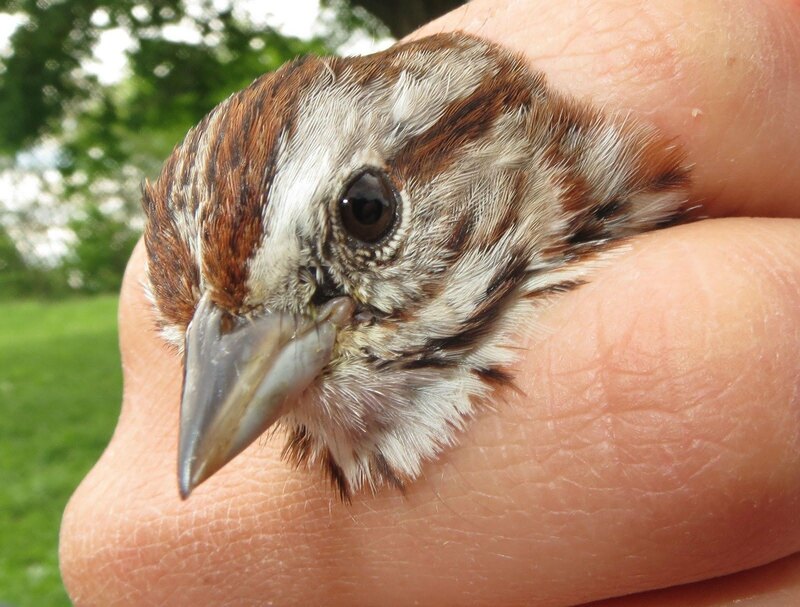 ), where they tested their hypothesis on a real population of breeding song sparrows (Melospiza melodia) (Fig. 2.) . To explore their question, the researchers captured birds briefly to take precise beak measurements. They also tagged birds’ legs with unique color bands so that they could match up individuals, once released, with the beak size measurements obtained in hand. They documented the temperature and microclimatic traits of birds’ breeding territories, and observed their use of local habitat. Then, they collected data on reproductive behaviors (such as singing), and thermoregulatory behaviors (such as moving from open areas to covered areas) that they saw. After lots of time spent trekking through the seaside dunes carefully observing tagged song sparrows, the breeding season ended and the researchers returned to the lab to analyze and interpret their field data. So…was there evidence to support their hypothesis? Yes! Luther and Danner found that larger-beaked birds sang more than their smaller-beaked counterparts. In fact, birds with the largest beaks sang nearly twice as much as those with the smallest beaks. As temperatures climbed, overall singing rates in the population decreased, confirming that heat is, in fact, limiting when it comes to singing, due to the energetic costs. Birds should be singing as much as they possibly can, since song is a crucial sexual signal used for attracting mates and defending breeding territories. This finding supports a link between climate factors (temperature), morphology (beak surface area), and behavior (singing), and suggests that bird beaks have a thermoregulatory function. As global climate change proceeds, heat waves are expected to increase in severity, presenting more temperature challenges for breeding songbirds. Understanding beaks as temperature regulation tools that can affect reproductive behavior in birds will help us explain potential population shifts and selective forces acting in a changing climate. Luther, D. and R. Danner (2016). Males with larger bills sing at higher rates in a hot and dry environment. *The Auk *133(4): 770-778.